Dandy is my very first puppy, born into my hands. 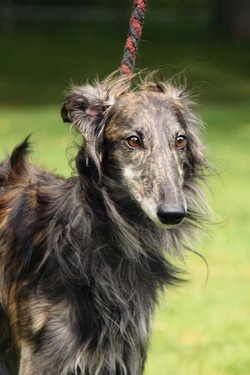 As Elven King's previous litter was all red brindles, I feared to get the same...Dandy was indeed dark brindle but had easy to see white "gloves" which gave him the name Dandy. Next puppy was dark brindle too but the following 5 were gold brindles, all with different "socks" so I could see which one was which ;-) I did not plan on keeping him but as nobody was interested, he stayed and I am very happy he did! Training: has his Obedience diploma, finished as best of 28 dogs! Dandy is my snuggler, always at my side on the couch. He likes the road working, as long as we don't go too fast. But that is all excercise I dare to give him, no more lure coursing or running around as I am too scared he might break again... Luckily he's no longer interested in the lure, even turned his head off when a dog came tearing by...much to my relief as once I had to drag him off the field, kicking and screaming, he wanted MORE!! Dandy posing as a VERY cute puppy...but beware, with his brothers and sisters he was a real hooligan! Dandy and his brothers Design (middle) and Dance. Dandy and his sister Destiny, shortly before she moved South to live with Marjan and Linda. Though playing rather wild from time to time, they also liked to snuggle up together and what better place than the couch? Left X-ray shows the #, right one the metal splint that kept the broken bones together. 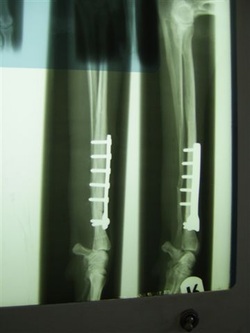 The second metal splint, incredible how the orthopaedic surgeon managed to get the screws into those bones, and so many! ..but still willing to help out! Only a week after being operated on, Dandy resumed his "duties" as special ear cleaner. Brocade regulary asks for this favour and in spite of that uncomfortable leg, he complied..
With the splint removed he could come along for ever longer walks, thus strengthening the muscles in that front leg. He is 20 mos old in these photos. With thanks to Tiina for the lovely pics!